Pork and Pork Recipes are interesting subjects. 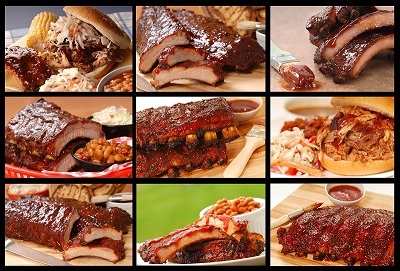 And I have some favorite restaurant recipes for pork for you to try. But first you should understand that pork is not really classified as white meat. It is really a red meat. It does become lighter when cooked, however. The "other white meat" was an advertising campaign. The advertising campaign in North America was the result of advertising consultants working for the pork industry in America and trying to compete with our consumption of chicken and turkey. Although pork is technically red meat, what is true is that most pork is low in fat content. And guess what? Pork is one of the most widely eaten meats in the world. Pork provides about 38 percent of the daily meat intake worldwide. Of course, consumption of the meat varies widely from one country to another. Certain Asian countries and certain European countries eat the most. Pork accounts for 70% of the daily protein intake in Korea and Vietnam. 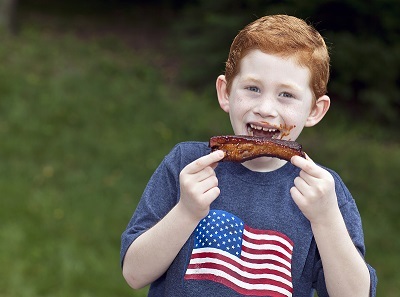 Americans eat a lot of pork, as well, most often pork chops, ham, bacon, pork loin, ribs and in sausages (like chorizo, fuet, and salami and breakfast-style sausages) and hot dogs. And pork consumption has been rising for forty years. Pigs (wild boar) have been around for thousands of years. They were probably domesticated first by the Chinese or at least somewhere in the Orient. They have been used as a source of food, clothing, hides for shields and bones for tools and weapons. Even their bristles were used for brushes. The fact that pigs are adaptable creatures made them easier to raise then other animals such as cattle. Americans drove more pigs west during our western expansion than cattle for this very reason. Pigs were originally slaughtered in the Fall and early Winter months, just as apples and pears were being harvested. That is why you'll find many pork recipes that include these fruits. Despite the fact that pork is now available year around, these pork recipes are still very popular in North America. If you have read through other material on this website, you have discovered that I am a proponent of natural products (fruits, vegetables, beef, chicken, etc.). I feel the same about pork. Whenever I can find natural (even better, organic) product, I buy it. Natural pork products contain no artificial ingredients and are no more than minimally processed (smoked, for example). No artificial ingredients, no preservatives and no hormones added to the natural product (no nitrates, for example). A recent study in America indicates that at least 65% of the population feels as I do. This trend is growing rapidly. The problem to date has been the cost of the preferred product. Demand outstrips supply. But with more and more farmers and ranchers returning to raising product naturally, I hope to see a reduction in price. 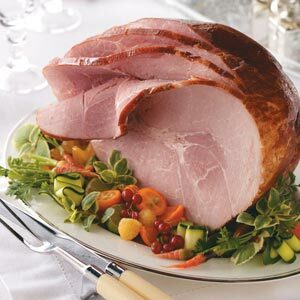 Baked Ham, especially this baked ham recipe is a favorite restaurant recipe on the weekends and for holidays. Preparation time: 1 1/2 hours. Serves 15. Restaurant guests count this restaurant recipe for pork spareribs as one of their favorite restaurant recipes ...but ...not for lunch. Why do you suppose? 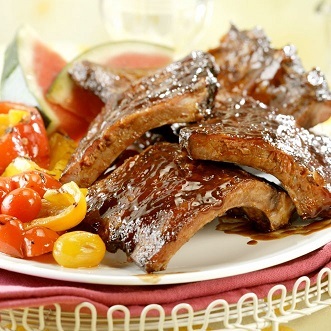 The Barbecue Spareribs are a two or three napkin meal! Preparation time: 20 minutes. 3-4 servings. This recipe for Barbecue Baby Back Ribs creates a "fall off the bone tender" and delicious meal. Preparation time: 10 minutes. Serves 6-8. You can use this recipe to oven bake or grill your BBQ pork ribs if you want, but this recipe explains how to cook them using your slow-cooker. Preparation time: 20 minutes. Serves 4. This Cider Glazed Honey Baked Ham is created by basting the ham with an apple cider, brown sugar, honey and mustard mixture with a bit of liquid smoke as it bakes. Preparation time: 10 minutes. Serves 8-10 people. For this restaurant recipe I don't use a true Country Ham. I use a good quality ham, however. 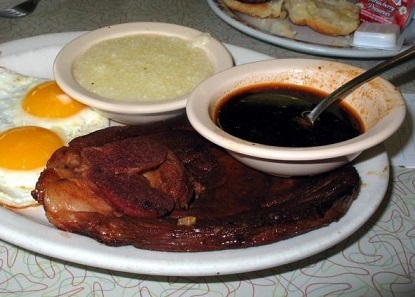 The Red Eye Gravy recipe is as close to the real thing as you can get without using a true Country ham. So I simply call it "Ham with Red Eye Gravy." Preparation time: 15 minutes. Serves 6. A brine pork recipe from the restaurant will all but guarantee the best pork roast you have ever prepared. Preparation time: 15 minutes but pork should marinate in brine for 12-24 hours. Makes enough brine for a 4-5 pound pork loin. I love stir fry. It is doesn’t matter whether it is a beef, chicken or pork stir fry. I also love vegetable stir fry. And I love to cook them. There is something fun about shaking the skillet or wok. Preparation time: 15 minutes. Serves 5-6 depending on portion. 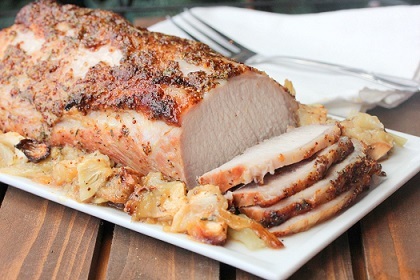 For this Pork Loin Recipe you will need the pork brine recipe that is also on my website. That and the restaurant recipe for pork gravy, again, on the website. Preparation time: Takes 2 1/2 hours to cook, depending on size (4-5 pounds) but the roast needs to marinate in pork brine for 12-24 hours. Serves 8. Enjoy these pork recipes and the company of those you share them with. Many more recipes and information coming.